One morning I was preparing to cook breakfast, scrambled eggs to be exact, when my three year old son joined me in the kitchen to ask if he could help with anything. This child is my youngest and usually the last to think of anyone but himself these days and so after I got over the shock of him wanting to help, I decided I would take this moment for us to have some quality time together. I informed my son that Mama was making scrambled eggs, but he surely could attempt to crack the eggs just like on the Wii game we play together called Cooking Mama, if he wanted to. Happily the three year old asked me to pull up a chair to the counter so he could crack eggs. The funny thing is, my son really thought that cracking eggs was just as easy as they look in the Cooking Mama video game! After two failed attempts at cracking an egg alone, I decided to assist with the egg cracking business by simply placing my hand above his and keeping him from tossing the egg shell into the bowl a third time. Success was made and the boy was smiling from ear to ear! After we placed three eggs into a small cereal sized bowl, I added some milk into a measuring cup so that he was able to pour milk into the bowl easily. I handed my son a fork after showing him a short tutorial on how to scramble up the egg yolk, egg whites and milk. I watched as my three year old son smiled the biggest smile ever stirring those eggs all up until they were blended good enough to scramble for breakfast. Since my son was so adamant on helping me with the cooking process, I took this moment to teach my son something that my sister and I used to do back in our younger years, cook scrambled eggs in the microwave. I took the cereal sized bowl full of eggs and milk over to the microwave where I placed them inside and closed the microwave door. From there I placed the cook time for one minute exactly and asked my son to hit the start button. I held my son in my arms as we counted down with the timer on the microwave and as it beeped he jumped out of my arms to hit the open button on the microwave. 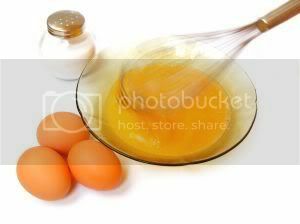 The next step was to stir up the eggs another time in the bowl and sort of chop up any egg that was cooked more than the rest of the egg inside of the bowl. My three year old son watched as I showed him what to do and he took over making sure the eggs were stirred up real good before I placed the hot bowl back into the microwave for another minute and a half. Once the time was up, we had a hot bowl of fluffy scrambled eggs ready to eat. I had my son help me move the eggs from the hot bowl into a room temperature bowl and we sat down to eat together chatting about what he just learned to do. This was the day that I realized my son was ready to start being more independent. Ever since that day my son has helped me prepare the bread for grilled cheese and prepared the eggs for me to cook on the stove top. I am proud of my little independent three year old, for he is learning to cook, help his mother and be a valuable part of our family unit by doing what he thinks is fun! This is a guest post written by Brandy Tanner, a NH Mom blogger who owns Happily Blended Blog, where she writes daily about her challenges in life, parenting and working from home but all with a positive mindset. Thanks so much for allowing me to write on your site! Such an honor to have a guest post here! hugs! That moment when you realize your child is growing up before your eyes is always both frightening and full of pride at the same time! My son learned how to make scrambled eggs in the microwave around that age as well! What a cute story. And...I have never tried scrambled eggs in the microwave...I will have to!